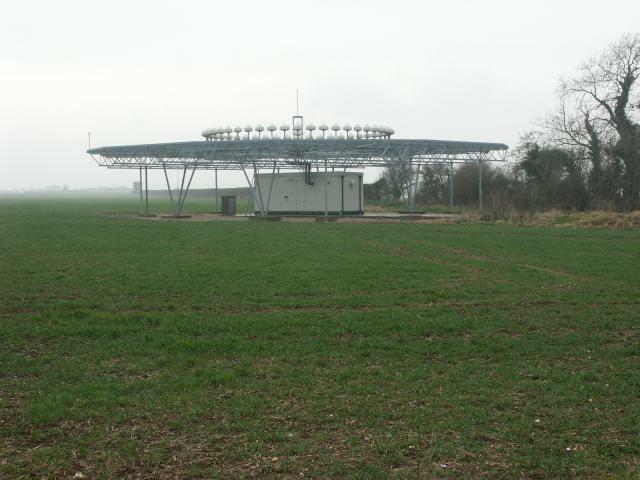 …is a DVOR (or Doppler VHF Omni Directional Radio Range), one of several in the country, used for guiding air traffic. 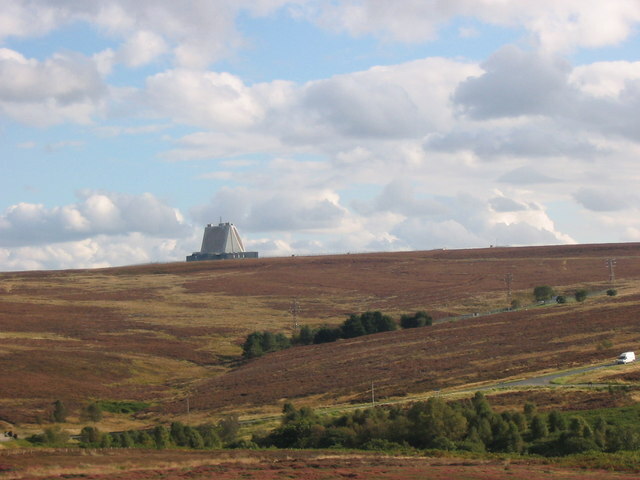 Amongst the most surprising of these large and slightly unsettling structures is the following, not least because it looms out as you drive along the busy M6 motorway in Lancashire, rather than some teeny-weeny country lane in the middle of nowhere. Despite its forbidding appearance, this is one of the most optimistic transport buildings ever built in Britain. It’s the Lancaster Service Area, and if it looks like the sort of place that Winston Smith might have stopped at for breakfast (if he’d had a car and, you know, Big Brother hadn’t been watching him all the time) then that’s only because when it opened in 1965, Brutalist architecture was the in thing. Motorways were still a new concept in Britain in the 1960s, the first one having opened in 1958 bypassing Preston. It soon became clear that some kind of rest and refreshment facilities would be a necessary feature of Britain’s developing motorway network. But what sort of places would they be? And where should they be located? The government of the day had the answer to the latter. The Ministry of Transport said they should be placed “where the motorway passed through pleasant rural scenery, so that their potential users might find them attractive and useful”¹, completely failing to anticipate how much of a blot on the landscape motorway services would eventually come to be regarded. That was how the Lancaster Service Area, originally known as Forton Services, came to be built close to the Lancashire village of Forton, in beautiful countryside a stone’s throw from the picturesque Lake District. The Ministry decreed that they should, however, be places which served through-travellers, rather than having wider ‘destination’ appeal (a policy which continues to this day). There wouldn’t be much point in having a new motorway getting clogged up with traffic generated by the motorway’s own service areas. The government had missed the point entirely that the motorways themselves would generate their own traffic, whether there were service areas or not, but there you go. It was a more optimistic time, and the assumption was that new motorways would be a free-flowing congestion-busting alternative to the existing network of awkward and wiggly trunk roads which had developed from ancient rights of way. As to what the new breed of motorway service stations would look like, London-based architecture practice T P Bennett & Sons had the answer. They would be angular Brutalist structures, made of concrete and faced with such beautiful materials as corrugated sheet asbestos. T P Bennett & Sons’ first motorway services was built at Strensham on the M5 (it has since been rebuilt). Forton Services was its second, but now its earliest surviving, example. Beyond just being Brutalist buildings, T P Bennett & Sons (architect in charge Bill Galloway, job architect Ray Anderson) decided in the case of Forton that it would be a landmark in its own right. 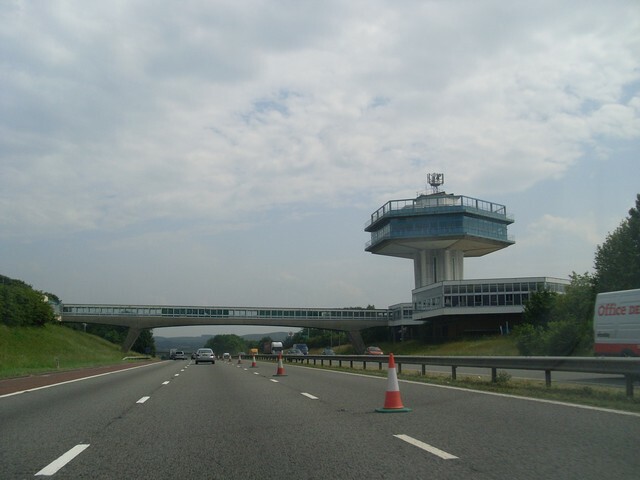 On the west (northbound) side of the motorway, Forton Services was to feature a 30.5m-tall tower with a restaurant on top, giving panoramic views over the Lancashire countryside, not to mention the Lake District to the north, and not forgetting the asphalt and concrete scar of the M6 itself cutting right through the middle of this pastoral paradise. 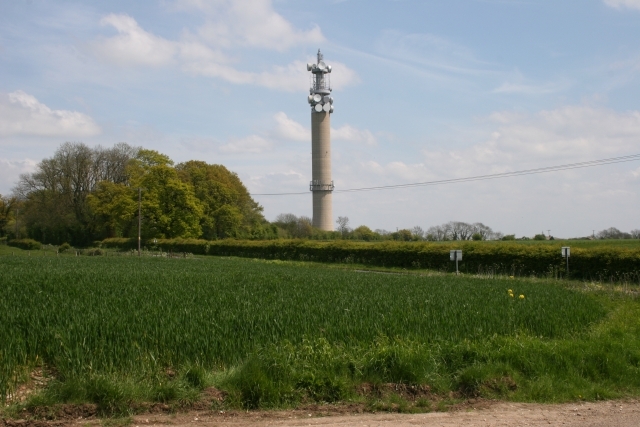 The restaurant tower (which gained the grand moniker “Pennine Tower” right from the start) was modelled to resemble an air traffic control tower, because at the time air travel was all glamour all the time; Comet jetliners and silver service. There were no charter flights or low-cost airlines back then. The Pennine Tower’s restaurant was one of a number of tower-top restaurants constructed in the 1960s. 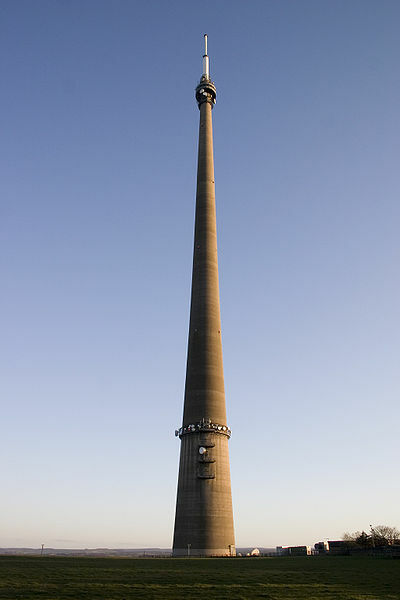 Similar facilities could be found at the Post Office Tower in London (also opened in 1965) and St John’s Beacon in Liverpool (opened in 1969) for instance. All subsequently failed, but that was for the future, and a less optimistic time. The local planners insisted on the height of the Pennine Tower being reduced to 22m, but it’s still an imposing structure. It is hexagonal in plan, and used to contain two pentagonal lifts up to the restaurant. The restaurant itself, cantilevered out at the top, featured splendid example of 1960s interior design including a fish-scale screen, geometric blue and white tiling, and timber soffits. It could seat 120 diners in the latest modern comfort, with waitress service. T P Bennett & Sons is still a going concern, and the company’s website has a gallery of gorgeous black and white photos of Forton Services as new, both interiors and exterior (see it here). On the outside, the tower was clad in corrugated asbestos sheeting. Narrow windows on the tower sides emphasise its slender form compared to the restaurant on top, and projecting stanchions lend considerable angular drama. The curtain walling of the restaurant is fully glazed. 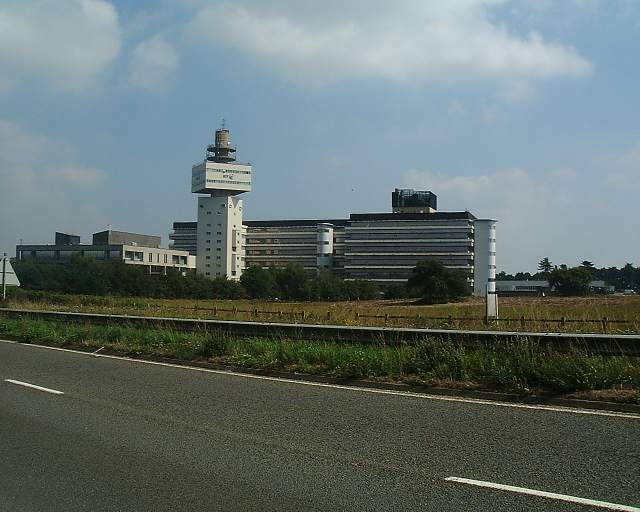 The tower sprang from a larger building at its base, also Brutalist and which contained all the other facilities needed for a motorway service area, such as the kitchens for the restaurant above, a self-service cafeteria, shops, telephones (no mobile phones in those days, remember) and toilets. In plan, the original building at the bottom of the tower took the form of several abutting hexagons, like a giant beehive. 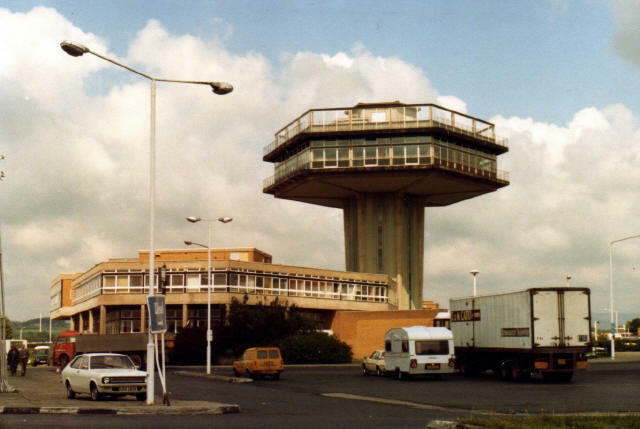 Just like a giant beehive, and despite whatever the government might have intended, Forton Services became a local honeypot destination in its own right. It seems vaguely incredible today, but the amazing 24-hour nature of the facilities, and their striking modern design, proved a considerable draw to the residents of nearby Blackpool, Lancaster and Preston. You have to wonder just how little there was to do in such towns in the 1960s for Forton Services to exercise such a magnetic attraction. The elevated restaurant was unique amongst Britain’s service stations, and was intended to allow diners to marvel at the astounding sight of cars travelling at speed on the new motorway, a technological marvel that would no doubt be of continuing interest and considerable visual appeal for years to come. As I said, it was an optimistic building, and it probably didn’t occur to anyone that before too long, people would be sick of the sight of motorways, and that before too many years had passed any house with line of sight to one would see its value suppressed. The most hopelessly optimistic part of the whole building, however, was immediately above the restaurant, where an open sun deck was provided on the roof, with a glazed balcony railing running all the way round. I think I can get away with saying this, having been born about 30 miles away from Forton, but the north-west of England, while famous for many things, is justly not famous for its sunny climate. It is, in fact, one of the wettest regions of England. The sun deck was probably of significant usefulness for no more than a few days every year. In what was then the standard design for motorway service areas, there were car parks on either side of the motorway, linked by a footbridge. These days service areas are built with full sets of facilities at both sides of the motorway, or there’s a road (rather than pedestrian) link between both sides, or the service areas are situated at motorway junctions allowing travellers from either direction access to a single site. 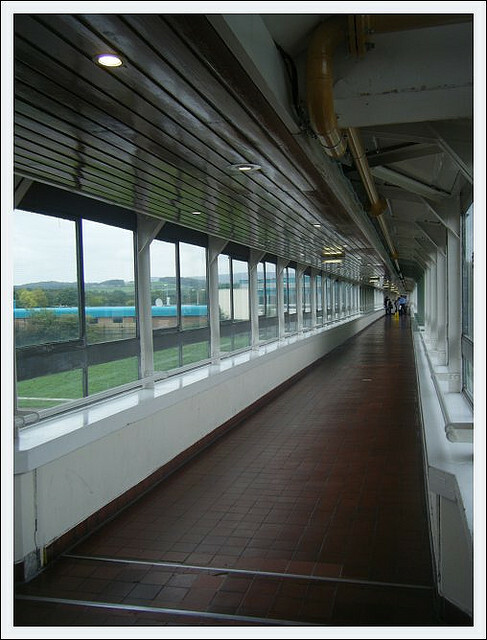 At Forton, however, the pedestrian footbridge was vital to allow access to the tower restaurant for both northbound and southbound travellers (other facilities like the self-service cafeteria, were duplicated on the southbound side of the motorway). It’s a very neat-looking footbridge too, designed by Lancashire County Engineering Department and clad by T P Bennett & Sons. The decades since its construction have been less kind to Forton Services. As the optimism surrounding the construction of the motorway network gave way to environmental concerns over its impact and induced traffic growth by the late 1980s/early 1990s, so Forton Services’ fortunes waned. Having changed hands several times, the ground level buildings on both sides have been altered and insensitively extended, losing much of their architectural integrity. The main internal staircase, hexagonal to match the six-sided motif repeated throughout Forton Services, was removed and the void covered over. The tower-top restaurant closed in 1989 because its staircases could not meet tighter fire evacuation regulations, and many of its fixtures and fittings were removed. No-one from nearby towns visits the Lancaster Service Area any more. Like the vast majority of Britain’s motorway service stations, it now holds only the scantest appeal. We have somehow ended up interpreting the need to ensure that motorway services do not generate traffic themselves to mean that they should be (with just a few exceptions) mean, expensive, ugly and depressing places, where even those travellers who are forced to use them want to spend as little time as possible. We have fallen out of love with motorway services just as we have fallen out of love with the idea that motorways are the panacea to our transport ills, the latest in a long line of transport planning’s fallen idols. The Pennine Tower’s restaurant stands empty, its sun deck (now sans glazed railings) doing nothing but collecting dirty puddles of rain. Its footbridge looks scruffy, and there’s no need for southbound travellers to use it anyway. There’s nothing different on the northbound side for them to get to. 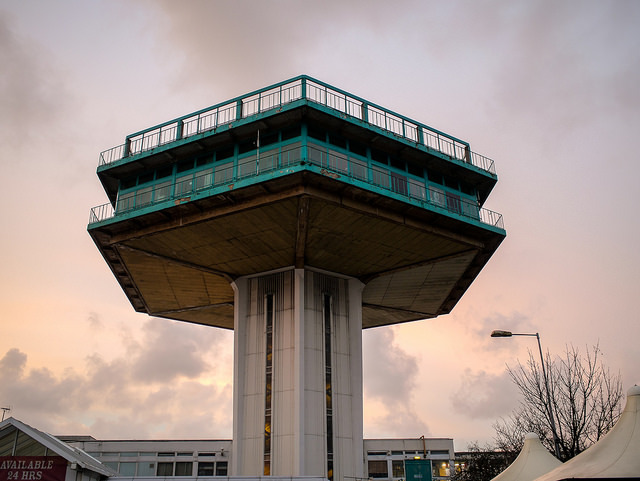 Forton Services is a Brutalist beacon of hope lost from its own time, a reminder of the golden age of British motoring for those who care to look beneath its bespoiled exterior. But it still has its fans. Andrew Garnett, deputy editor of UK industry news magazine Passenger Transport says, “It’s more than just the regular, nosh-bar pull-in architecture you expect to see at the side of the road. It encapsulates all the hope of the 1960s for the future”. 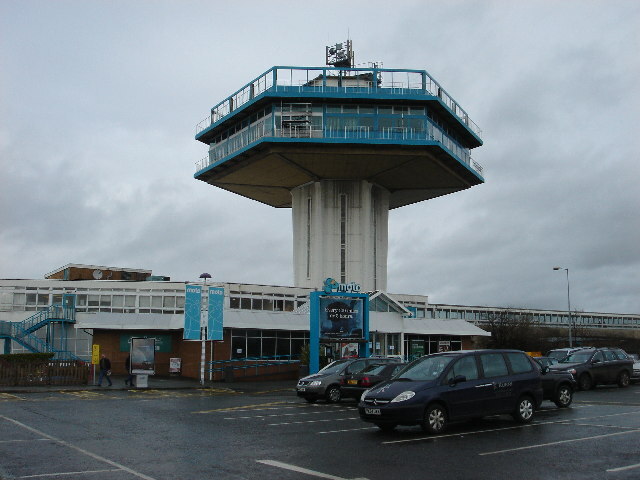 Historic England, the national heritage body, granted the Pennine Tower Restaurant Grade II listed status in 2012, but excluded Forton Services’ lower-level buildings (“compromised by later extensions and alterations”) and its footbridge (“not technologically innovative”). 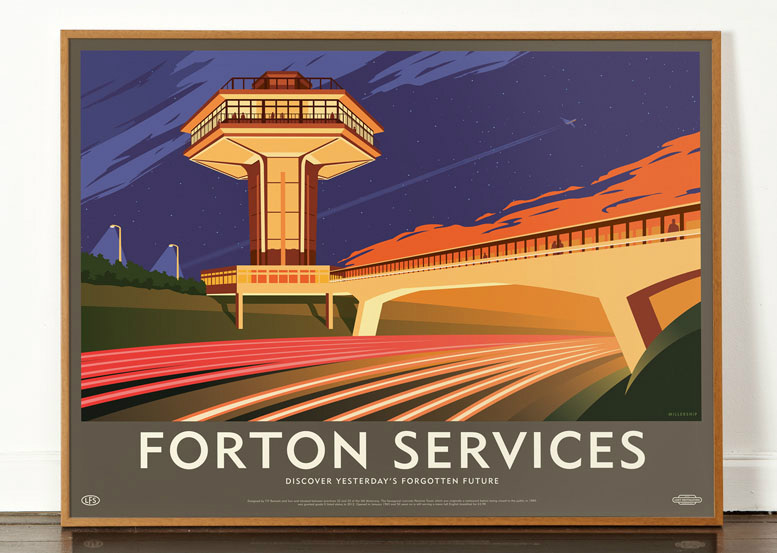 Art and design studio Dorothy has, however, produced an utterly splendid print of Forton Services when new (above), superbly capturing the original appeal of this building of the future. It’s just a shame that the future, as always, isn’t what it used to be.